The first picture shows the damage to the fire ring on #4 cylinder of the returned head gasket. Note: the condition of the fire ring in the adjoining cylinder which did not fail. The head gasket failed from detonation causing thermo push fracturing the fire ring. The following picture shows the result of thermo push caused by detonation. Conclusion: Inspection revealed the head gasket failed due to detonation resulting in thermal push. Detonation is uncontrollable combustion creating combustion temperatures and pressures exceeding cylinder components design capabilities. The first picture shows top view and measurements of head thickness variations. 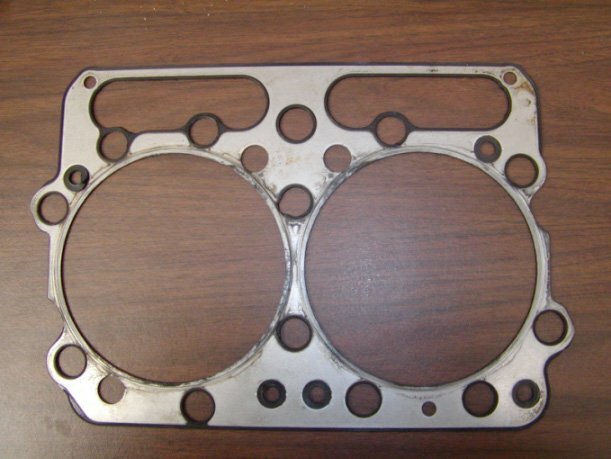 Note lines on gasket indicate head surface may be too rough. 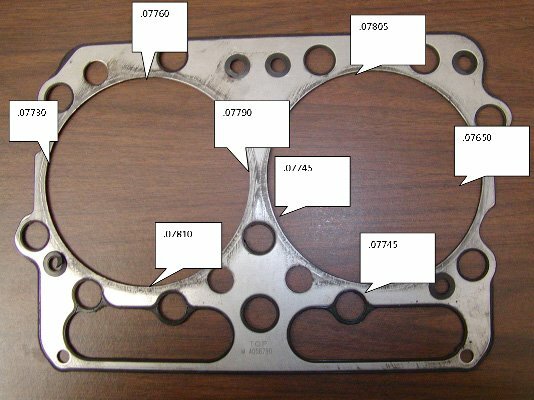 This picture shows bottom side of head gasket; note no coarse resurface lines showing. Conclusion: Minor variations in the gasket thickness indicate surface flatness, liner perpendicularity and even head bolt clamping force. Failure of seals was caused by too rough a surface on the cylinder head. This allowed multiple combustion leak paths resulting in damage to the head seals. Claim: Water leakage from o-rings during engine run in and the seal rings “contracted”. Observations: Gasket was examined for possible leak cause. Red Silicone sealant was found around the water and oil sealing areas. Gasket was assembled using a liquid gasket compound. 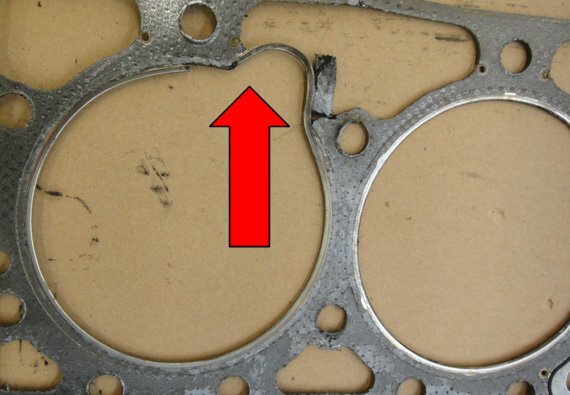 This is never advised and prevents proper seating of the gasket, as well as uneven loading and increases stress on assembled joint and gasket. Liquids are not compressible and therefore can cause many problems on assembled joints. The liquid also creates a low coefficient of friction and will actually lessen proper torque value. Gasket sealer has extruded into the seal area, potentially the reason of the complaint of seals “contracted” when in actuality, liquid rubber has cured inside of the seal area.